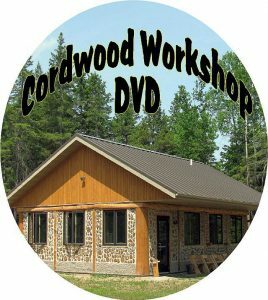 Folks have been asking about our northern Wisconsin cordwood home and how it has “held up” after 40 years. Here are some pictures, commentary and a few links, should you care to delve deeper. 30′ x 40′ Post and beam framed with Northern White Cedar on a frosty November morning. We capped it with a truss room-in-the-attic (a Swiss Chalet style roof). It gave us an additional 560 sq. ft. of living space (two large bedrooms and a half bath). Interior walls and ceilings are made from locally milled Norwegian Pine (also called Red Pine). 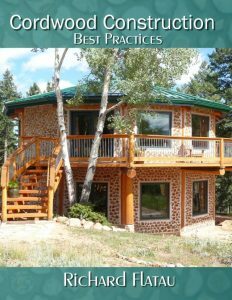 In a nutshell, our cordwood home is doing just fine. The mortar is in good shape, there is no degradation of the wood and our home is cool in the summer and warm in the winter. Who could ask for anything more? At 720 pounds, the Hearthstone Wood Stove supplies all the heat we need. 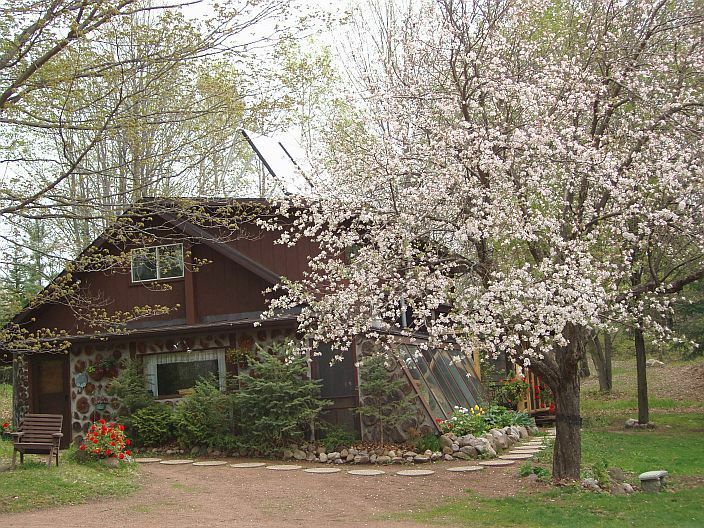 Having a large thermal mass, a passive solar design and an attached solar/greenhouse room helps to moderate the interior heating and cooling. 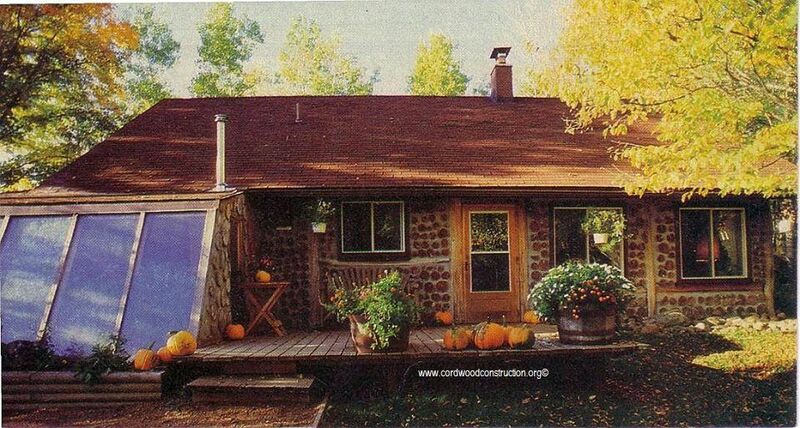 The photo above was taken when the Mother Earth News sent a photographer from New York to document the Mortgage Free Cordwood Article we had written in 1980. The always reliant 65-year-old Yellow Transparent apple tree provides fragrant blooms every spring. Note the domestic hot water solar thermal panels on the roof. 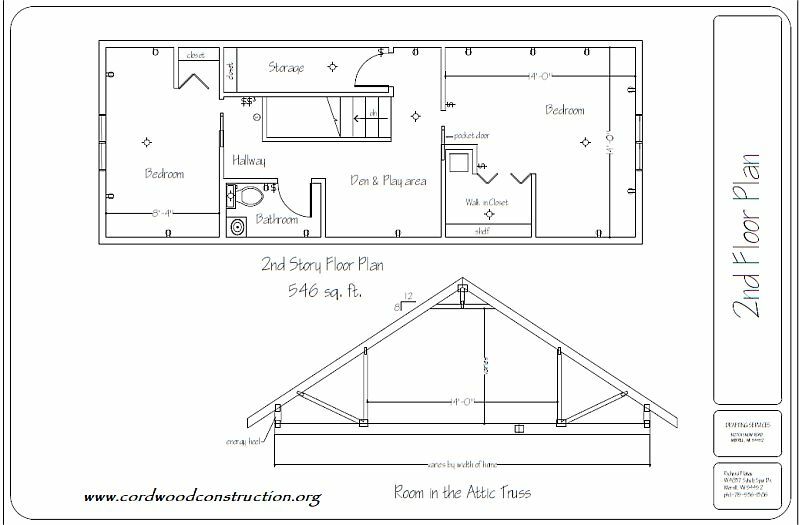 Above is the Truss Room in the Attic truss that increased our home by 560 sq. ft. It cost the same as a traditional roof. The Home Comfort wood cookstove is used many times a year, but especially around the holidays. Many articles have been published about our little cabin in the woods over the past four decades, here are links to the last and the first. Click on the picture to be taken to website for more information.